I have been working on some projects. I've been painting a little chest to keep my new chair company and it is almost ready. It would already been done, but there's a big party today that I have to get ready for. It's called Pillowpalooza 2012- a party just for pillows! Pillows deserve a little attention now and then don't you think? I've never been one to miss a party, so I had to make something to wear! 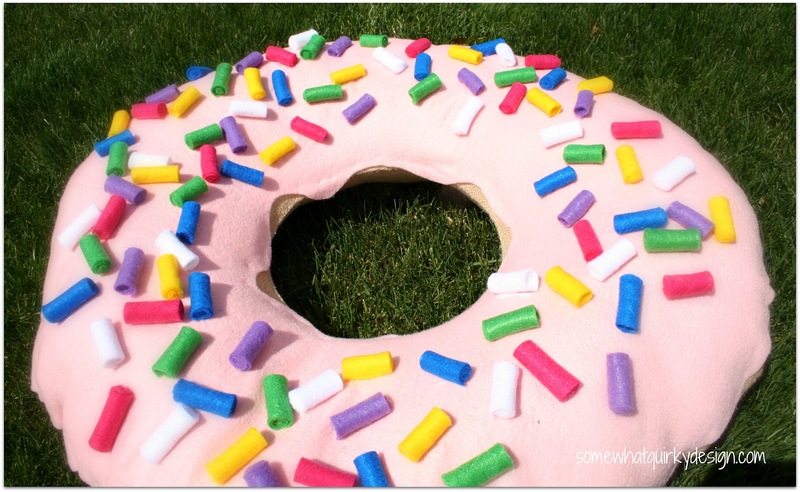 A couple of years ago I was reading a magazine while I was working out and saw a picture of what I thought was a pillow made to look like a doughnut. Turns out it wasn't a pillow - actually I don't remember what it was - but ever since then I have been wanting to make a pillow that looks like a doughnut. I haven't actually done that, because I wasn't sure what I would DO with it once it was made. Yesterday I decided to throw caution to the wind - because what fun would a party called Pillowpalooza be without a doughnut. And, if I can talk her in to it, I'm going to give it to my sister. She kind of likes doughnuts. 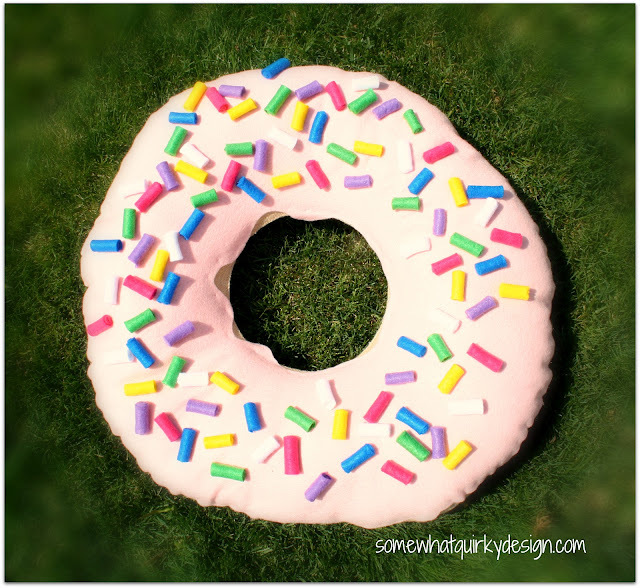 Problem #2 - How do you stage a doughnut pillow when you don't have any children's "stuff" or children? I'm going to take it to a friends house who just had a baby and use it as a photo prop. I think the little baby will be all the staging it needs! 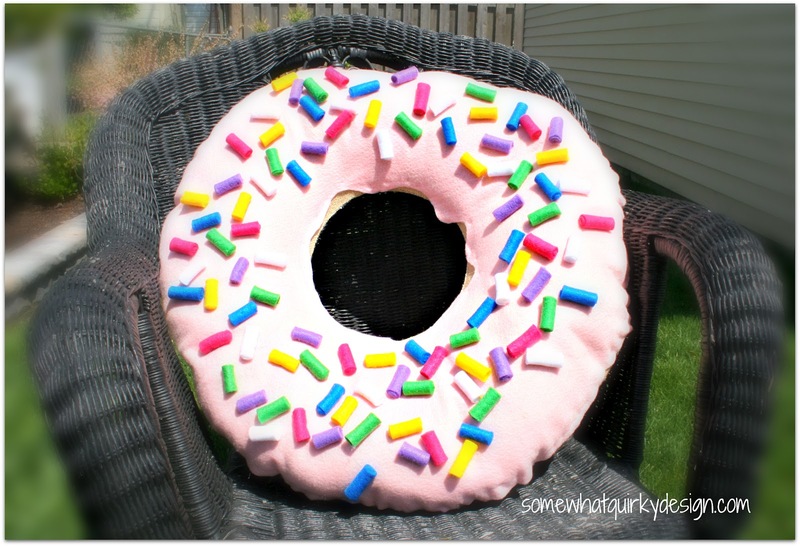 In the meantime, my little doughnut pillow will just have to lay out in the sun or relax in a garden chair. Tomorrow I will show you how I made my little doughnut with strawberry icing with sprinkles. In the meantime, I hope it has fun at the party! Maybe we can go to a few other places while we are out. That pillow came out so awesome! I had to do a double take. I thought it was a real doughnut sitting in that chair and I wanted a big bite of it. Thanks for linking up to our party! I had to read the post twice to see if that was actually a doughnut! What a cute pillow. Of course I'll take it. It will go perfectly in my classroom. this is great! and i love your sister's take on showing restraint! That is adorable, Karen! 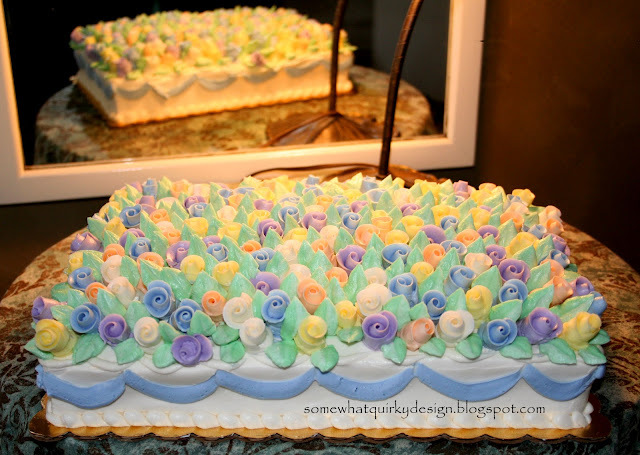 I was concerned that I was going to gain 5 lbs just looking at your blog!! LOVE it! I just nominated you for the Versatile Blog Award. Check it out! How very clever of you! So thoughtful of you to bring a big overstuffed snack to the party! 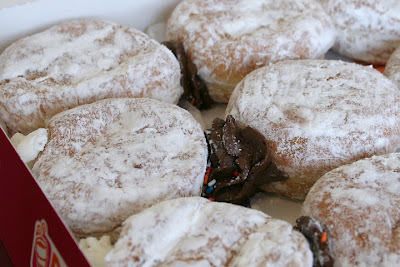 ... and that continues to be, to this day, my daughter's favorite Dunkin Donuts donut! What a CUTE pillow! I love it! Great gift for the donut lover!! This is so adorable! I have been gluten free for two months and the one food that I missed the absolute most is donuts! Maybe I need a pillow like this... or would this be torture? Too cute! It is such a neat idea. The doughnuts picture had me salivating! I think I just gained 10lbs! !